Bespoke Wooden Plantation Shutters. Now in Whitley Bay! Conservatory Shutters in Whitley Bay for the changing weather. 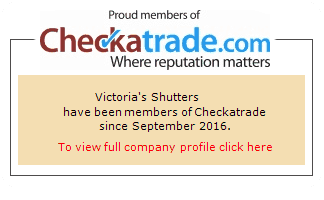 Plantation Shutters Whitley Bay - for the best home in the neighbourhood. Kitchen shutters are all the jazz this summer! Imagine a sunny day after a mediocre spring. That day when the sun shines high and you can go outside, relax and get some tan. After a week you will still enjoy the rays of sunshine but wouldn’t it be nice if you could hide for a moment during that garden party where you invited all your neighbours, and enjoy a little bit of cool shade thanks to your lovely kitchen shutters. And they are so convenient that they will allow you to peek outside to make sure everybody is having fun while you’re enjoying your break. 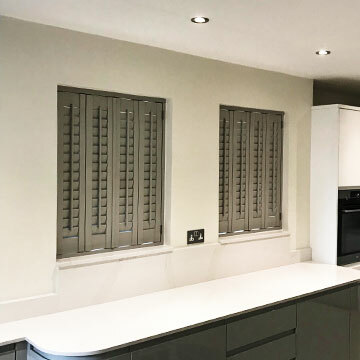 Have a look at our recent installation of grey plantation shutters that match this kitchen design perfectly! How to maintain tilt rod kitchen shutters? Our tilt rod kitchen shutters require little effort in terms of maintenance. Use a paper towel or a cloth to wipe the dust off when it accumulates. Duster will work as well but choose one that can easily fit between the slats. If you’ve just replaced your curtains with kitchen shutters, sit back and enjoy the thought that you will never have to wash these curtains again not to mention the heavy lifting task of putting them up again. Preparing homemade meals is much more fun when the kitchen in which we cook is aesthetic, and additionally, the decor elements are durable and practical. Victoria’s Shutters kitchen shutters combine all these features. Our plantation shutters blend in perfectly with the dining room, making eating together more enjoyable. Plantation shutters are perfect for both classic interior design and innovative projects. If you are a demanding client, they are the best choice concerning the design, functionality and convenience of use. 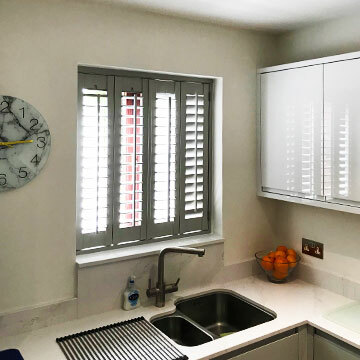 In addition to purely practical values, such as regulating the amount of sun, shutters give the interior of your kitchen a stylish and extraordinary character as they combine natural beauty and a sense of luxury.